If you imagine what a bee looks like, you’re probably thinking about a European honeybee. As the “European” in the common name suggests, these bees did not occur in Australia until they were introduced for honey production almost 200 years ago. 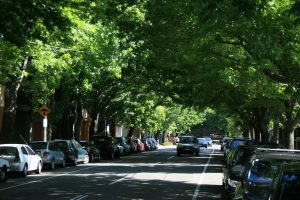 Having established themselves away from the beekeepers’ hives, European honeybees are now feral in Australia, often building hives in tree hollows. These feral bees are important crop pollinators. 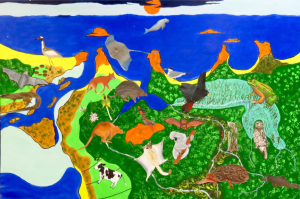 But, on the downside, they out-compete native animals such as birds and mammals for nesting hollows, and occasionally also for pollen and nectar. There are many other bee species in Australia, that are native to this continent, and many of them could visit your garden. In fact, there are about 1,650 species of native bees known for Australia and 20,000 bee species known worldwide. But we haven’t stopped counting, and scientists are regularly discovering new species of bees. Among native bee species there is large variation in shape, size, coloration, nesting habits, behaviour and flower preferences. For example, the largest species (a carpenter bee) is less than 25 mm long, while the smallest species are more than ten times smaller, at about 2 mm long. Native bees are quite different to honey bees. The European honeybee is highly social, with hives having a queen and several thousand workers. In contrast, most native bees are solitary and nest alone. A single female bee builds a small nest and then does all of the tasks that are necessary to support new offspring. 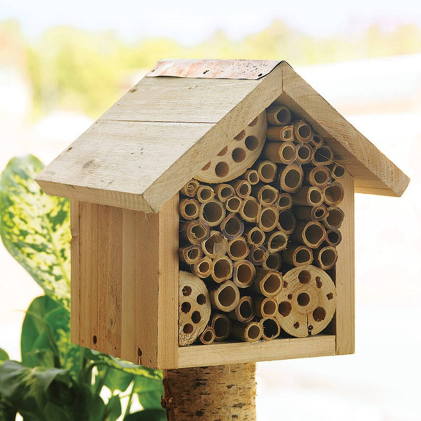 There is often a shortage of suitable nesting places and building materials, so native bees will readily take up “artificial” housing if you provide it. 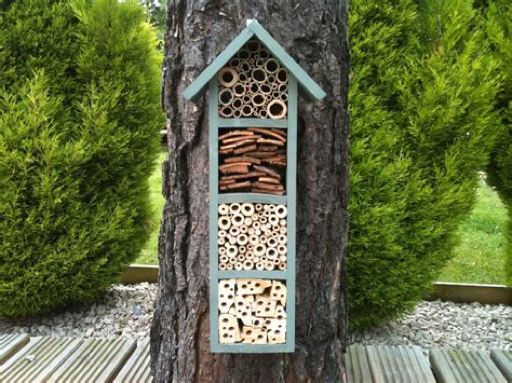 Such housing is commonly called a bee hotel. 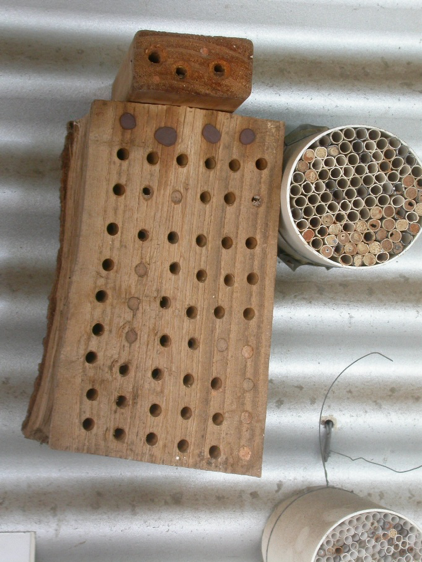 It is easy to make a Bee Hotel, by drilling holes in a piece of timber or by providing suitable tubes for native bees to nest in. For example, bamboo sticks can be used. Bamboo should be cut into short lengths, just behind the nodes, so that there is only a hole at one end. Or a bundle of paper straws in a tube can be used. The straws can be bundled in a piece of drainpipe or in an empty drinking bottle. 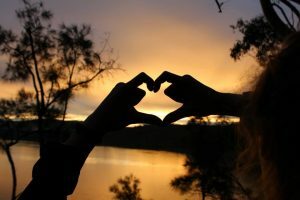 The ABC’s Gardening Australia, also offers advice on how we can be friendly to our native bees. A weather-proof house, eg, old TV set, terracotta pipe, old letter box. Corflute Sheet – available from hardware stores. Attach this to the roof of the bee hotel to keep the rain out. A range of different diameter materials eg terracotta pipe, bamboo stalks, clay-filled pipes to fill the casing. clay packed into pipes or concrete blocks, and when semi-dry poked with a screw driver to push 10 – 15 cms holes deep into the pipe. Pack the casing with some or all of these “rooms”, so that nothing moves about and cover it so rain is not a problem. If you can add a landing strip for the native bees this would be a plus. Site the Bee Hotel about 1 metre off the ground, where it receives morning but not afternoon sun, and in an open area, then wait for occupants to arrive. Carpenter bees like dead pithy stems, while Leafcutter bees prefer borer holes in logs, and Blue-Banded bees go for clay rich soils. 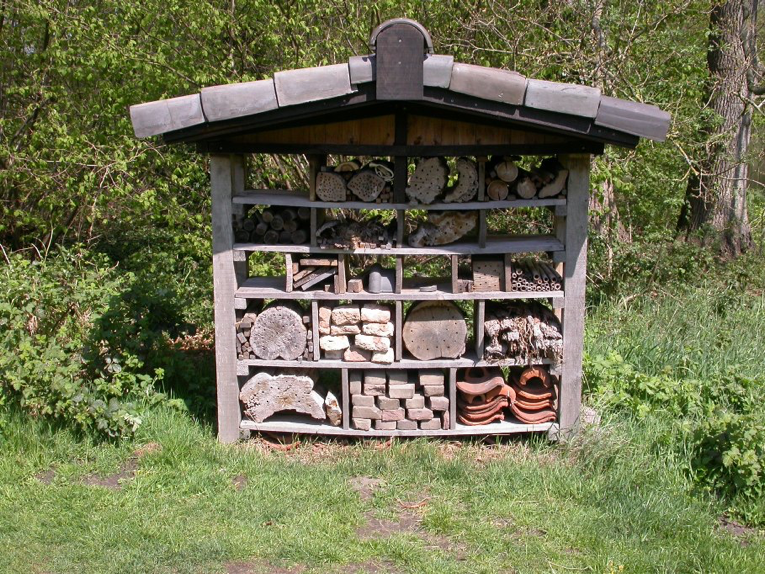 Some Bee Hotels are relatively complex, but native bees aren’t all that fussy about where they lay their heads. This website, has a very clear 8 steps to follow to make a simple Bee Hotel, while, this website will even sell you a ready made one. But if you are a teacher at a school, you can probably get one for free.